Some books attempt to extend portfolio theory, but the real issue today relates to the practical implementation of the theory introduced by Harry Markowitz and others who followed. 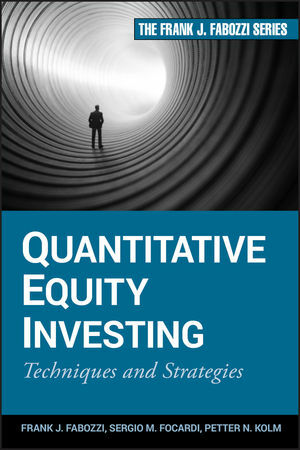 The purpose of this book is to close the implementation gap by presenting state-of-the art quantitative techniques and strategies for managing equity portfolios. Throughout these pages, Frank Fabozzi, Sergio Focardi, and Petter Kolm address the essential elements of this discipline, including financial model building, financial engineering, static and dynamic factor models, asset allocation, portfolio models, transaction costs, trading strategies, and much more. They also provide ample illustrations and thorough discussions of implementation issues facing those in the investment management business and include the necessary background material in probability, statistics, and econometrics to make the book self-contained. In today's financial environment, you have to have the skills to analyze, optimize and manage the risk of your quantitative equity investments. This guide offers you the best information available to achieve this goal. Frank J. Fabozzi is Professor in the Practice of Finance and Becton Fellow at the Yale School of Management and Editor of the Journal of Portfolio Management. He is a Chartered Financial Analyst and earned a doctorate in economics from the City University of New York. Sergio M. Focardi is Professor of Finance at EDHEC Business School in Nice and a founding partner of the Paris-based consulting firm The Intertek Group. He is also a member of the Editorial Board of the Journal of Portfolio Management. Sergio holds a degree in electronic engineering from the University of Genoa and a PhD in mathematical finance from the University of Karlsruhe as well as a postgraduate degree in communications from the Galileo Ferraris Electrotechnical Institute (Turin). Petter N. Kolm is the Deputy Director of the Mathematics in Finance Master's Program and Clinical Associate Professor of Mathematics at the Courant Institute of Mathematical Sciences, New York University; and a founding Partner of the New York–based financial consulting firm the Heimdall Group, LLC. Previously, Petter worked in the Quantitative Strategies Group at Goldman Sachs Asset Management. He received an MS in mathematics from ETH in Zurich; an MPhil in applied mathematics from the Royal Institute of Technology in Stockholm; and a PhD in applied mathematics from Yale University. In Praise of Mathematical Finance. Studies of the Use of Quantitative Equity Management. Looking Ahead for Quantitative Equity Investing. Chapter 2 Financial Econometrics I: Linear Regressions. Regressions, Linear Regressions, and Projections. Chapter 3 Financial Econometrics II: Time Series. Estimation of Stable Vector Autoregressive (Var) Models. Estimating the Number of Lags. Autocorrelation and Distributional Properties of Residuals. Stationary Autoregressive Distributed Lag Models. Estimation of Nonstationary VAR models. Estimation with Principal Component Analysis. Estimation with the Eigenvalues of the Companion Matrix. Chapter 4 Common Pitfalls in Financial Modeling. Engineering and Product Design in Finance. Learning, Theoretical, and Hybrid Approaches to Portfolio Management. Pitfalls in Choosing from Large Data Sets. Time Aggregation of Models and Pitfalls in the Selection of Data Frequency. Model Risk and its Mitigation. Chapter 5 Factor Models and Their Estimation. Factor Analysis and Principal Components Analysis. Why Factor Models of Returns. Approximate Factor Models of Returns. Chapter 6 Factor-Based Trading Strategies I: Factor Construction and Analysis. Building Factors from Company Characteristics. Chapter 7 Factor-Based Trading Strategies II: Cross-Sectional Models and Trading Strategies. Cross-Sectional Methods for Evaluation of Factor Premiums. Model Construction Methodologies for a Factor-Based Trading Strategy. Backtesting Our Factor Trading Strategy. Chapter 8 Portfolio Optimization: Basic Theory and Practice. Mean-variance Optimization with a Risk-Free Asset. Estimating the Inputs Used in Mean-Variance Optimization: Expected Return and Risk. Portfolio Optimization with Other Risk Measures. Chapter 9 Portfolio Optimization: Bayesian Techniques and the Black-Litterman Model. Chapter 10 Robust Portfolio Optimization. Using Robust Mean-Variance Portfolio Optimization in Practice. Some Practical Remarks on Robust Portfolio Optimization Models. Chapter 11 Transaction Costs and Trade Execution. A Taxonomy of Transaction Costs. Market Impact Measurements and Empirical Findings. Forecasting and Modeling Market Impact. Integrated Portfolio Management: Beyond Expected Return and Portfolio Risk. Chapter 12 Investment Management and Algorithmic Trading. Market Impact and the Order Book. Some Comments about the High-Frequency Arms Race. Appendix A Data Descriptions and Factor Definitions. The Compustat Point-in-Time, IBES Consensus Databases and Factor Definitions. Appendix B Summary of Well-Known Factors and Their Underlying Economic Rationale. Appendix C Review of Eigenvalues and Eigenvectors.